Black and gray Ninja AF101 is a 2018 release air fryer with a sleek and modern design, 1550-watt power, a programmable base, an extra large 4-quart size basket with a ceramic coating for air frying, reheating, dehydrating, roasting and baking for your whole family. You can basically put two pounds of French fries in its decent size basket without adding any oil and get great results. Ninja Air Fryer has a score of 4.7 out of 5 stars by 22 customers as a very popular product at Amazon.com despite being a very new release. You’ll get Amazon product support with this air fryer, and free of charge. You can use little to no oil when cooking or frying foods in this brand new Ninja and your meal will have roughly 75% less oil than conventional frying methods. This is not just a random guess but a result of a test in which they compared the hand-cut fries in the air fryer vs. a deep fryer. This means you’ll enjoy the exact same taste and the golden crispy texture with much less oil and calories, without feeling any guilt. The temperature range is specified as 105°F–400°F in this air fryer, and you can get rid of the moisture in your ingredients slowly, fry or cook them quickly with the equally and quickly distributed convection heat. It comes with a large 4-quart size nonstick basket with a ceramic coating and a crisper plate where you can fit up to 900 grams of fries. The low temperature and low fan speed available on this air fryer allow you to use it as a dehydrator to make tasty and healthy, flat chip-like dried foods on the multi-layer rack included in the package. You can make beef jerky, dried fruits and veggies and more. It is easy to clean overall and the multi-layer rack, the crisper plate and the frying basket are all safe to be put in the dishwasher. You can roast chicken, veggies, beef, casseroles and more without needing to use your large oven. If you have any leftover chicken wings, pizza, fries or other meals from yesterday you can reheat and revive them to their original taste and texture. 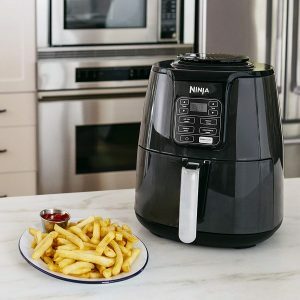 Black and grey Ninja Air Fryer is easy on the eyes with a modern design, weighs 13.14 pounds and measures 8.5 x 12.1 x 11 inches. It is lightweight enough and you can store it in the kitchen cupboard or keep it on the counter as it looks good. The basket has a non-stick teflon-like, FDA approved, PTFE-free ceramic coating that is also easy to clean, and you won’t find any plastic inside. The single-touch LED-backlit control panel has the Time up and down, and Temperature up and down to control time and temp manually, 4 programmable cooking functions of Air Fry, Roast, Reheat, Dehydrate, Power and Start/Pause. 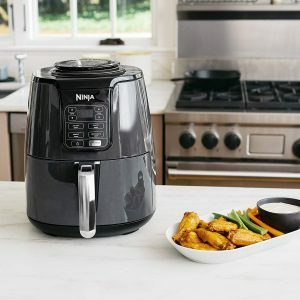 Black and grey Ninja Air Fryer is easy on the eyes with a modern design, weighs 13.14 pounds and measures 8.5 x 12.1 x 11 inches. It is lightweight enough and you can store it in the kitchen cupboard or keep it on the counter as it looks good. You won’t get a cookbook included in the box, but some suggestions in the user manual and on the sticker on the unit with the recommended time and temperature for different food groups. It won’t get hot on your counter, the bottom, the top and the handles will stay cool. A small turkey will not fit in this air fryer but a chicken or turkey pieces will and the taste and texture will surely be awesome. One of the customers cooked turkey breast in this one and it turned out great even though how dry and low fat turkey breast is. You’re recommended to use the crisper plate to lift the food in the basket, so the air goes underneath and crisps food evenly. The tater tots, chicken wings and French fries are tender inside and crispy on the outside. It will cook your steak nicely, tender and moist inside and seared as well on the crisper plate. You can cook fish, chicken, tater tots, sweet potato fries and more in much less time than a toaster oven. You may want to check what you’re doing in the middle of cooking just like you would with an oven. Ingredients may get stuck together or not cook properly if you turn them over or shake. It is easy to use straight out of the box and seems to offer decent value for the dollar.